When "Charlie's Angels" came out in 1977 and became enormously popular, there were rip-offs anywhere. 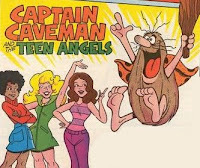 Even in the cartoon world, which featured one of the weirdest shows ever, "Captain Caveman and the Teen Angels." "Captain Caveman (voiced by Mel Blanc) is the main character, a caveman who is thousands of years old (his exact age is never disclosed). He can pull various objects from his body hair. He can also fly, but his flying power always seems to conk out on him at the worst possible moment. Sometimes he would attribute this mishap to an energy shortage ("Uh oh! Bad time for energy crisis." CRASH! ), which was a pun on the gasoline rationing shortages of the late 1970s. He speaks in stereotypical "caveman-talk", replacing subjective pronouns with their objective equivalents and dropping articles such as "the" (for example, "Me know where bad guys are hiding. "), and often mumbles the nonsense phrase "unga bunga". He also has a bad habit of occasionally eating large non-food objects in one gulp (i.e. bicycles, TV sets, safes, table lamps), and the Teen Angels occasionally have to stop him from eating potential clues that will help them to solve the mystery." Pulled objects out of his body hair? Had to be stopped from eating the clues? Energy crisis jokes? Unga bunga? And they say HR Puffnstuff was drug-inspired! My friends and I watched this. We were very little. I remember we ran around yelling "captain.. CAVE-Maaaaannnn!"